David Tillman’s journey to the public health field took a winding path, but his love for Harnett County and rural North Carolina has never wavered. After graduating from Campbell with an English degree, he spent nearly 10 years working with public schools to improve outcomes and programming for students with disabilities. Tillman soon discovered a passion for improving health in rural communities, where the best in programming and care is often miles away. Three more degrees later, Tillman was the first faculty member brought onboard when Campbell began its Public Health program. He now serves as the chair of the department. Campbell’s Public Health program is unique in that it is specifically tailored to focus on rural health. It’s one of six schools in the nation with a rural focus, only two of which are located east of the Mississippi river, and it is the only Association of Schools & Programs of Public Health-accredited program in the country that both focuses on rural health and is actually located in a rural area. Tillman’s goal for the program is to help people understand that location is a key factor in the rural health conversation that is often overlooked. “If a doctor tells me that I need to lose weight and I should go running to lose it, it’d sound pretty reasonable,” he says. “On the Cary Greenway, I’d run on a paved path in the shade with scenery and dogs on leashes. But if I run in Harnett County, there’s no shoulder on the road, dogs are chasing me because there are no leash laws in rural places, and there are tractor trailers whizzing by my head. Tillman’s research shows that social and economic factors play a larger role in the health of a community than we recognize. Problems such as poor dental care, higher rates of suicide and increased risk of motor vehicle accident deaths are usually attributed to a lack of care facilities in rural communities. But the number of providers per capita in a given area is usually only a small part of the issue. He uses motor vehicle traffic deaths as an example. The risk of death may be higher in rural areas because it takes longer to get to a hospital from the scene of a crash. But in most cases, the risk is simply increased because we drive faster on rural roads than in town, and consequences are deadlier at 55 miles per hour than 30. Cultural relevance is a huge part of what Tillman is working to create in rural health programs. A language barrier is far easier to overcome in clinics in urban cities than in rural ones, so making sure that everyone who visits a clinic can be understood could help solve the rural health problem. Economics impact how clinics are used as well — a rural town could have a dentist on every corner, but if no one has coverage for its services, no one will go anywhere but the emergency room. Tillman also wants to combat the myths and stigmas about health care that are not considered when finding solutions to low engagement with clinics. The lack of anonymity in small town and rural America make it difficult to seek help for matters patients would rather keep private. Tillman uses his own vehicle as an example — in Raleigh, driving a red truck isn’t noteworthy. But driving a red truck in Buies Creek means that everyone will know who drives it. When his truck pulls up to a mental health clinic, everyone will know he’s seeking help. Working in communities to improve the acceptability of seeking care is the mission of Tillman’s students at Campbell. During a presentation of their capstone project, a team of students who spent their semester offering free long-acting reversible contraception (LARC) to Scotland County residents reported that only two women decided to utilize the LARCs. Students found that common myths — the contraceptives would prevent them from ever having families in the future, or that other methods of birth control were more reliable — were the primary cause of the low numbers. 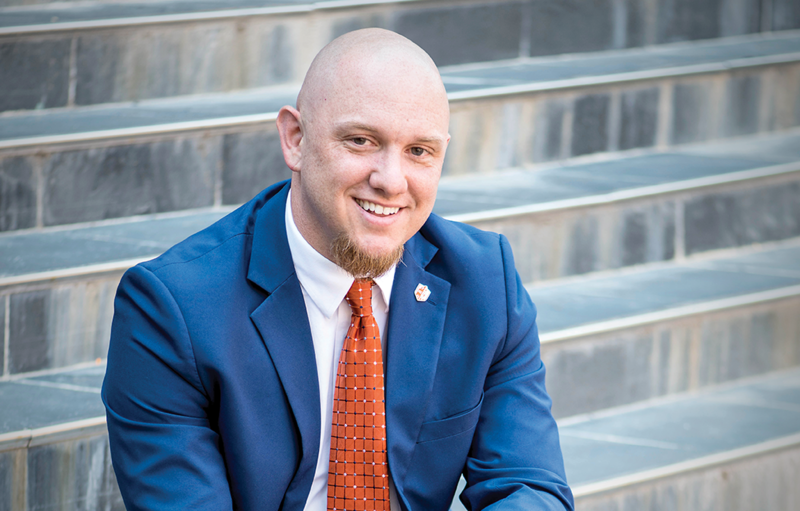 Tillman feels that Campbell has a unique opportunity to change stigmas associated with a variety of preventative healthcare measures, from counseling and birth control to needle exchange programs that help fight the opioid crisis. In his classes, students are encouraged to work with the close-knit faith communities to bring better quality of life to rural areas. In the near future, Tillman hopes to see public health improved with technology. He recently met with the National Rural Health Association in Washington, D.C., and talked to representatives about medical coverage, socioeconomic factors and internet access in rural communities. Broadband could change the rural health landscape by providing a means of diagnosing and treating patients remotely. But for Tillman, the true benefit of internet access is economic development.